South Carolina LowCountry Nature Journaling and Art: Redbuds Blooming Early! This is the first day in a while that's been nice when Rob has it off :) We took advantage... Off to the driving range we went. Rob with clubs, me with paints. 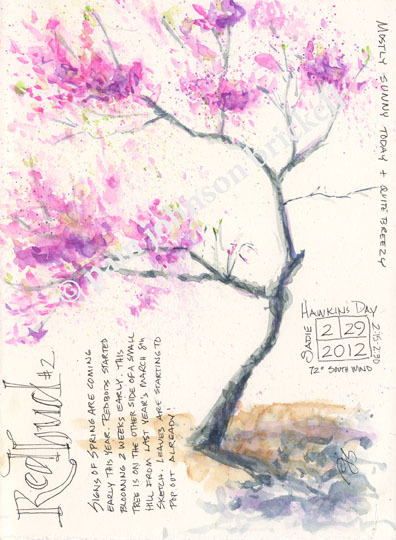 This little Redbud sits just over a small hill from the tree I painted last March 8th. This year the Redbuds started blooming about 2 weeks early. The leaves on this one are already starting to pop. I know it's been quite a while since my last post. Please bear with me. We are in the process of packing for a move and my job at Spring Island is incredibly busy. It felt so good to sit a bit and take in the beauty of the day. Every now and then it's good to go on strike! I am ready to turn the page on the calendar at work tomorrow, because I know it is the Redbud!!! Peepers yet? Rainy and cold and wet here today snow and ice as well. We have types of precipitation covered here today.Things are early here too. You are moving, Pam? I hope it goes well. I just changed your calendar today and got to see the lovely Redbud for March :) Lovely work and a breath of spring - which we are still having; warm and windy and even the birds are confused! ha ha Lovely painting, this little redbud - they are the first arrivals (along with forsythia) here, too. Beautiful pink for all of March, Carol :) No peepers but the Leopard frogs started calling in late January! Thanks, Rhonda! Yes, moving... as much as I dislike the whole process the new place is larger, more storage and lots of windows... so the carrot is dangling :) Wish we had forsythia here but the yellow of the jessamine helps herald in the first signs of spring. ...beautiful painting of the tree. I love the colors and spontaneity...the splatters look really cool. Good luck with your move! Thanks, Kelly! This is the sweetest tree with its lovely arching shape. I, too, enjoyed seeing the turn to a new page on my calendar with your lovely red buds. And this page is gorgeous too! My daffodils are blooming already - a full month earlier than the past two years. But I won't argue with an early spring! Good luck with your move! Thanks, Ann! I saw a sign that the local daffodil farm is in bloom and ready to pick your own. I'm impressed that yours are blooming, too! What's going on?